Made with a smaller sweep and a 24 inch handle, this broom is perfect for the young’uns or small spaces. 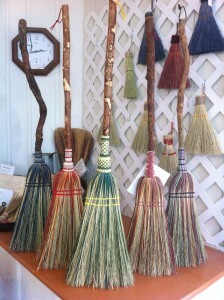 Most every broom we make is made to be used (every broom, if you believe that decoration is a use), and we make them for most every purpose and person. Take this broom. It’s just the right size for your child or grandchild to help out with the sweeping chores, but works well as an oversize hearth broom or as an RV broom – it’ll make sweeping smaller areas a breeze and doesn’t take a lot of space to store or display.